A slate engraving and a stone cairn were recently unveiled in Stornoway as the first in a series of events to commemorate the centenary of the Iolaire disaster (Here). Before being used by the navy in anti-submarine and patrol work, the Iolaire had been a luxury yacht prior to the First World War. It was 31 December 1918, the war was over, peace was restored amongst the nations, and, after four long years, the men who had served King and country were on their way home. The Kyle of Lochalsh quay was crowded with servicemen, and the steam ferry, the SS Sheila, was soon packed to the rafters. The Iolaire was sent for from her berth in Stornoway to transport the extra men back home to Lewis. She was kitted out with only two lifeboats and 80 lifejackets as 283 servicemen made their way up the gangplank and onto the ship. At 2.30 am on New Year’s Day 1919, a mile out of Stornoway, in poor visibility and deteriorating weather, the Iolaire sank after colliding with the infamous rocks known as “the Beasts of Holm.” The lifeboats were launched and immediately swamped as men battled each other to fill the few available seats. Men jumped in and made for shore but were drowned in the freezing conditions between the ship and the rocks. Devastatingly, having survived the war, over 200 men on board died within sight of the lights of Stornoway. In the midst of the unfolding tragedy, John Macleod from Ness embarked on a mission to haul a rope to shore. He made it to the rocks and that rope was the lifeline along which many of the survivors made it to safety. For his bravery John Macleod was awarded the highest peacetime award for heroism for his incredible courage and strength. In Matthew 16:18, after Peter’s confession of Jesus as the Christ, the Lord responded, “And I also say to you that you are Peter, and on this rock I will build My church, and the gates of hell shall not prevail against it.” This verse makes it clear that building His church is what Christ has promised to do throughout history and that His church will prevail over all else. For this is the Church that Christ loved and gave Himself for (Ephesians 5:25). These verses ought to challenge us. If Christ has promised to build His Church, and will prevail, ought we not desire to be involved in that process? Furthermore, if we love Christ, the head of the Church, we must also love the body connected to Him, the church. Do we want to be co-workers and fellow-builders, involved in this process of building Christ’s church? Will we give ourselves for what Christ gave Himself for? What is the church? Firstly, the Church is not a building, however helpful and desirable a building may be to a ministry. The Church is a people, with or without a building. Our own Scottish history speaks to us of the Covenanters, who were ejected from their churches and driven to worship in the open fields. Secondly, how does Christ build his Church? He does so through the faithful preaching of the Gospel, as it is applied by the Holy Spirit. We see this in Acts 16, as the church was built in Philippi. Concerning Lydia, “The Lord opened her heart to heed the things spoken by Paul,” (verse 14). Paul said to the demon possessed slave girl, ““I command you in the name of Jesus Christ to come out of her.” And he came out that very hour” (verse 18). Famously, the Philippian Jailor was converted, as God sent an earthquake to open the doors of the prison and the jailor’s heart (verses 25-34). Christ was building His Church in Philippi and Paul was His instrument. Thirdly, how is the success, or health, of a church to be evaluated? In our day the first consideration is normally the size of the congregation. We tend to equate a large congregation and numerical growth with success. However, some of the largest congregations in our land do not preach the Gospel clearly or promote and uphold Christlikeness and holiness. At the same time we must be careful not to equate small numbers as evidence of our orthodoxy. A common consideration is activity – a busy church with lots of programmes is considered to be spiritually alive. However, filling people’s schedules with activity does not necessarily imply spirituality. The true test of the health of a church is whether or not we growing in grace and knowledge of our Lord and Saviour Jesus Christ (2 Peter 3:18), given to prayer (Acts 1:14) and bearing fruit (John 15:8). Mission is a fundamental aspect of Christ’s building of His Church. The aim of mission is the worship of God, where He is glorified as the elect are gathered into the Church from all nations. Man does not win souls for Christ, as we are reminded, “without Me you can do nothing” (John 15:5), neither is it a joint effort between God and man, as it is Christ who builds His church. However, Christ does use the instrumentality of man in this building process. We are to obey, to go, to speak and to pray, believing that it is God who gives the increase (1 Corinthians 3:6). It is not an option, but a Gospel imperative, that we go into all the world (Matthew 28:19). Mission is based upon God’s Word: we are to teach and observe all things He has commanded us (Matthew 28:20). For this reason, there ought never to be a watering down of standards to make things more palatable to the unreached. Rather, there ought to be a positive and confident resting upon God’s Word, in doctrine, worship and practice as doors are opened (1 Corinthians 16:9) and the work of mission is engaged in. Our first thought when we consider mission is often that of foreign mission. But consider that, in Acts 1:8, before His ascension, Christ instructed the disciples first to go to Jerusalem, then to the surrounding regions of Judea and Samaria and then to the end of the earth. The pattern was to go to their own people and culture first and only then to the ends of the earth. Even those who had known much privilege and had rejected the Messiah, delivering Him up to be crucified, were to hear the Gospel. Furthermore, when we consider mission, we are often neglectful to consider our own home congregations and our responsibility to be salt and light (Matthew 5:13-14) to our families, friends and community. Are we praying for the lost and are we willing to step out of our comfort zones and invite people to church, just as Andrew who brought his brother to Christ? “He first found his own brother Simon, and said to him, “We have found the Messiah” (which is translated, the Christ). And he brought him to Jesus” (John 1:41). There is a mission field on our own doorstep. When it comes to foreign mission, it has been said that there are 3 possibilities. You can be a goer, a sender or disobedient. The Gospel is to go to “every tribe and tongue and people and nation,” (Revelation 5:9) and we ought therefore to pray that the Lord would send labourers into the harvest, for the harvest truly is great, but the labourers are few (Luke 10:2) Are we praying, both in public and in private, that the Lord would send forth labourers? The Bible does not assume that everyone will go to the mission field. Some, like Paul who took the Gospel to Europe (Acts 16), are called to go abroad with the Good News. 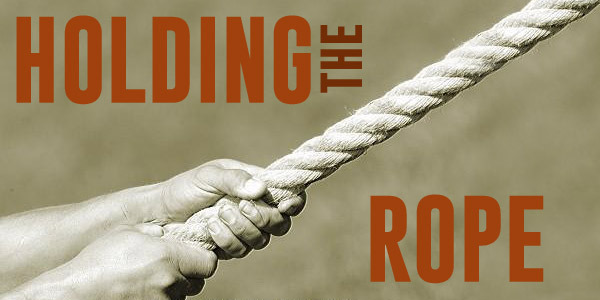 Others are called to hold the rope of support by sending, upholding and praying for missionaries. We ought to pray that their mission would be blessed of the Lord, as they face health issues, financial stress and persecution, even to the point of their lives being on the line. Do we take the opportunity to involve ourselves in the work of mission, individually and corporately? Or are we disobedient, leaving it to the concern of others? There are a multitude of ways we can support mission from keeping ourselves informed about the work, praying for the work, giving financially to the work and encouraging others to become involved. Paul recognised and thanked the Lord for the church in Philippi, “for their fellowship in the gospel from the first day until now” (Philippians 1:5). There is much scope to make Christ known to the lost and, God willing, to plant sound Reformed churches in lands where the Gospel is unknown. John Macleod’s mission back in 1919 was to hold the rope, make it ashore and save the lives of those who were drowning. There are many who have gone out, like John Macleod, with no less courage and heroism, to take the Gospel to the nations. He brought a lifeline to shore, these men and women bring a line that leads to a heavenly shore, to an eternal life, that delivers from rocks much more terrible than the Beasts of Holm. Let’s hold the rope with them and strengthen them in their labours. But let’s not forget that the rope first passes through our own homes, communities and nations. Only hands that offer the rope of the Gospel nearer home can truly hold it with those who take it to the farthest reaches of the earth. Christ would have us do both. It’s how He builds His Church. Great.So blessed by the detailed explanation of missions that I want immediately to pass the message around .